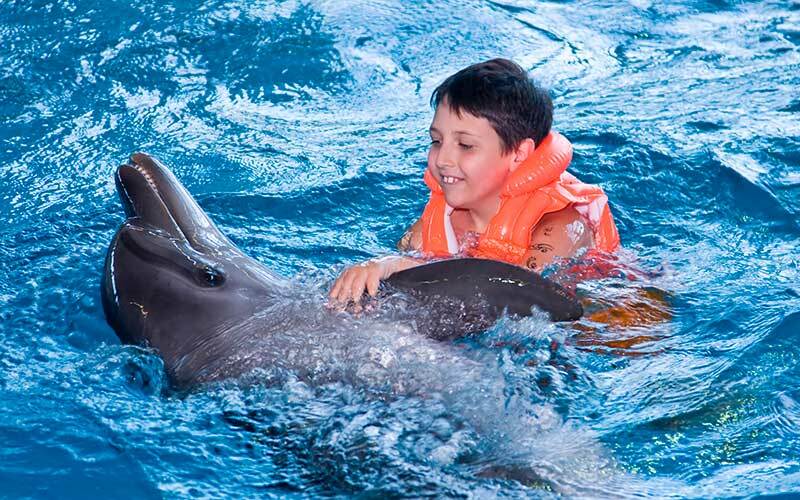 Dolphin Assisted Therapy (DAT) has been used as a therapeutic approach to increase speech and motor skills in patients with developmental, physical, and emotional conditions, such as Down syndrome and autism. Have you seen children and adults wearing lifesaving vests and swimming happily with dolphins in a pool? How easily does a dolphin approach these strangers? How nice do these people seem to be spending time? Well, this image may correspond to a dolphin-assisted therapy program, a different activity than “swimming with dolphins” that only focuses on introducing people to the water with dolphins, teaching them some features of the cetacean and having a fun time. Dolphin-assisted therapy is a variant of the therapy with animals and consists in the interaction of these animals with people suffering from a physical, congenital or psychological conditions or diseases. According to the WDCS (Whale and Dolphin Conservation Society), this therapy treats children or adults with physical, emotional and mental disabilities in a controlled program that uses dolphins in captivity or sometimes part of a population living in the wild. People who have taken therapy with dolphins describe the experience as “magical” and say that it improves the quality of their life. These dolphins are trained to socialize with people, and their company, focused in swimming along with them, touching them and observing their tricks and stunts, has a positive effect on the health of these patients. From this perspective, dolphins are practically therapists. A program to perform these therapies requires a whole arsenal of elements to be reliable, safe and have the proper results: dolphin trainers, veterinarians, human therapists, adequate infrastructure for patients and dolphins, and of course, a budget to preserve the health of these therapist animals. People who have taken this kind of therapy with these cetaceans describe the experience as “magical” and say that it improves the quality of their life. Judith Simon Prager, author, and writer of several texts on the subject says there are notable improvements in people with Down syndrome or cerebral palsy and in general, many people believe that swimming with dolphins has extraordinary results in the wellness of patients with any health condition. It was a woman named Betsy Smith who started this practice in the 1970s after observing the interaction between her brother, who was mentally ill, and a dolphin. In 1987, some researchers conducted a case study where dolphins were used to encourage an autistic child to communicate with people. The results convinced Betsy that this kind of therapy with these intelligent and friendly animals was like a new medicine to heal people. Since then, various centers, dolphinariums, and aquariums have started offering dolphin-assisted therapy for all types of people, including pregnant women who they say will get a benefit for them and their babies. It is currently a very popular and demanded activity throughout the world, offered as a cure and frequent in places with access to the ocean. These places charge a considerable amount of money to allow access to the water and have interaction with the dolphins as well as the backup of human professionals who regulate the activity, which has a variable duration. Generally and according to the condition, a series of several sessions is recommended to get results from the therapy. Betsy Smith disengaged herself from dolphin therapy in the 1990s, after rethinking the ethical implications of the practice. At present, many scientists and researchers have challenged this therapy as they ensure that there is no scientific evidence of long-term improvement. It is likely that positive effects in the mood will occur only for a while. Conclusive research is still needed to ensure the effectiveness or non-effectiveness of these therapies. Lori Marino, a neuroscientist at Emory University (USA), is one of the people who questioned the efficiency of the treatment for any disorder and warned that the practice is a risk for dolphins and patients. Like her, other researchers advised about the danger of swimming with a large animal that can hurt the patient even without intention, and that dolphins suffer keeping them in an unnatural environment. This neuroscientist also says that if people knew how dolphins are captured to take them into captivity, they would think twice about attending some animal therapy. Even psychologists say it has no efficacy for any disease and has risks for dolphins and patients. In conclusion, definitive studies are still necessary to ensure the effectiveness or non-effectiveness of these therapies. Although attending to one of these centers implies knowing the conditions of the dolphins in the dolphinarium (or similar facilities) and the decision lie with the person. The theory states that the unconditional love and support that a dolphin offers can benefit children and other patients by helping them to learn and develop trust. Many believe that dolphins have human-like emotions and the compassion they provide increases self-confidence, social skills and academic achievement in children and others who may be lacking these abilities. Since its’ introduction, dolphin assisted therapy has become a very controversial topic in the medical world. Theories such as the one by Nathanson suggest that this therapy is simply a program that works to modify behavior by rewarding the patient with dolphin swims for performing the desired function. Others, however, think that the sonar of the dolphins can trigger the healing process by increasing T-cells and endorphins. Common uses for DAT include healing and pain relief as well as increasing attention span, enhancing learning, and improving motor skills and coordination in children and adults. Although no scientists claim to know exactly how it works and there is no scientific data to back up these claims, dolphin-assisted therapy is increasing in popularity and is available at several aquariums in the United States. At the Clearwater Marine Aquarium in Florida, for example, children can participate in several programs designed to modify their behaviors with rewards such as swimming with and feeding the dolphins. These programs, however, come with a hefty price tag that can range anywhere from $2,000 to $6,000 for 5 or 6 days. Those critical of DAT, however, argue that just buying a small pet for the child will have the same effect and others argue that holding dolphins in captivity for what they deem “strictly recreational purposes” should be considered cruelty to animals. Scientists also doubt the ability of a dolphin to sense and target a particular tissue with their sonar. While research into the validity of dolphin assisted therapy continues, should be understood that DAT is not a miracle cure and people should avoid any organization promising such kind of recovery. Donald Altschiller. Animal-assisted Therapy. ABC-CLIO, 2011. Leah Lemieux. Rekindling the Waters: The Truth about Swimming with Dolphins. Troubador Publishing Ltd, 2009.